This is one of the best kept secrets in south Arkansas. Cane Creek consist of 2100 acres of wooded area as well as a 1675 acre lake. The trail loops around the lake. From the Sate parks website: "You will traverse a maze of small creeks that etch their way along deep draws between the steeply sloping ridges of a thick forest interspersed with dogwoods. Then, as you begin to revise your preconceived picture of southeast Arkansas, the trail bends around to open views of a lake filled with tall snags, water lilies, lotus blossoms and, bald cypress brakes. Camping is allowed only at the Cane Creek Lake Trail Camping Shelters (after mile 6, then east .5 miles). A required camping permit is available at the state park visitor center. Watch for the three unique suspension bridges along the trail. Mountain bikers will really enjoy the quick rolling hills and beautiful scenery. Please remember to always wear a helmet while riding in the park or on the trail." As stated, there are three great suspension bridges among around 50 other bridges on this trial. There is also about a half mile of wooden boardwalk going through the wetter section. Going clockwise, the last 5 miles of the trail are along the levee on the backside of the lake. For me, the best ride is out and back to about the 9 mile marker or the actual Cane Creek suspension bridge just on the far side of the boardwalk. Review: The wife and I rode this trail and it was Great!! We drove 2 hours to ride this trail not knowing much about it. What we found was a flowing 16 mile trail and lot of wild life. We rode the trail clockwise. Do you and your spouse a favor and take a ride to Cane Creek. 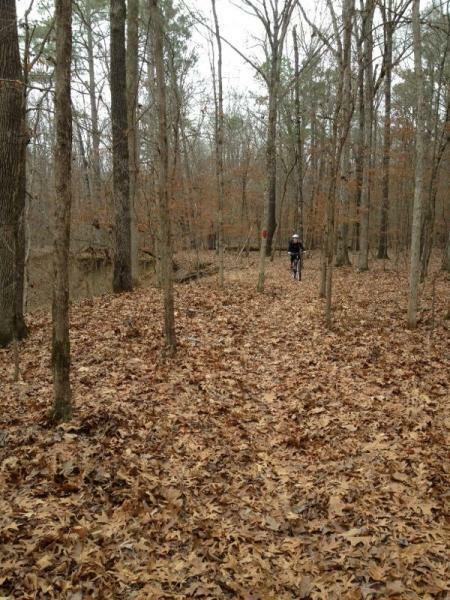 Cane Creek Lake Trail MTB Trail 3.50 out of 5 based on 2 ratings. 2 user reviews.